You’ll be surprised how quickly you can get here from Asheville. 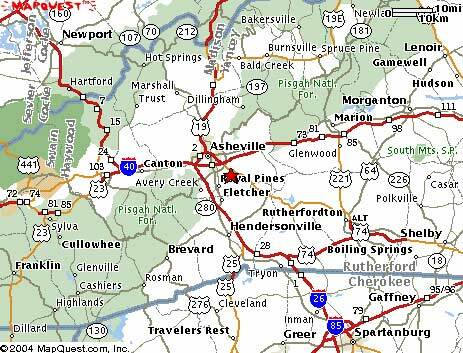 It’s a straight drive southeast from Asheville on Highway 74A. Located in the rural community of Fairview, North Carolina, Cloud 9 is a 15 minute trip from downtown Asheville going southeast. Just 2 miles from the Scenic “Drover’s Road”. Highway 74A East makes grocery stores, restaurants and health food stores easy to get to in 5 minutes. Biltmore Estate and the Grove Park Inn are just 15 minutes away. The NC Arboretum, and Asheville Regional Airport is an easy 22 minutes away. Black Mountain and Chimney Rock Park are 25 minutes away. Cloud 9 Farm consists of a valley farm divided by the public road, with a half-mile private driveway with an entrance gate. Our secluded rentals anchor the mountain top: Cloud 9 Relaxation Home, Heavenly Hideaway Cabin, Silver Lining Cabin, and Sawyer’s Cabin. And, no… you don’t need 4 wheel drive to get here. Our driveway is maintained and a safe slope to traverse in any vehicle. At 2400 feet elevation there are still mountains to look up to, but the long-range view of another valley makes you appreciate NC’s nickname, “Land of the Sky”. 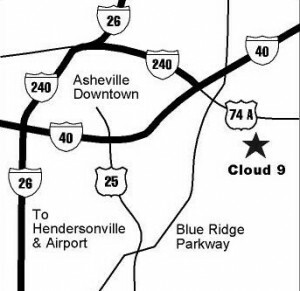 You’ll need to get to Asheville and connect with I-40 Asheville exit 53A to Hwy 74A East. Signs say Blue Ridge Parkway/Chimney Rock/Lake Lure/Fairview. Or take I-240 south through Asheville, take Exit 9 which connects with Hwy 74A East. Go 5.2 miles on 74A East. At the 3-way intersection, turn right at the light on to Emmas Grove Rd. If you are coming from Fletcher, follow Cane Creek Road to Highway 74. Turn left. Travel about 2 miles and turn left on to Emma’s Grove Road at the lighted 3-way intersection. Further directions will be given upon booking. We are a gated, private, farm/estate and only open to paid vacation renters with reservations. You will also be given a gate code to access the property. Entering this private property is by appointment or rental only. Tours by appointment. Call Janet at 828-628-1758 or send an email to cloud9relaxation@gmail.com for booking your next trip. Please note: We do not advertise on Craig’s List. Too many Scams!